ΗIP | GEORGE D. GOUDELIS MD. Ph.D. The hip joint is a synovial articulation between the acetabulum of the pelvis and the proximal femur. 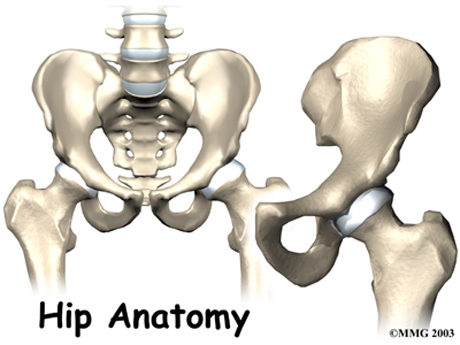 The hip is a ball-and-socket joint. The socket is formed by the acetabulum, which is part of the large pelvis bone. The ball is the femoral head, which is the upper end of the femur (thighbone). The capacity of the joint space is relatively small, with hip joint recess achieved with 10 ml of fluid. The femoral head is covered by hyaline cartilage, whereas the acetabulum is lined by hyaline cartilage in an inverted U shaped with a fibrocartilage labrum attached to the acetabular rim. Several muscles originate from the pelvis and extend across the hip joint and others originate from the femur itself. Muscles that originate from the posterior surface of the ilium, (gluteus maximus, gluteus medius and minimus), are extend the hip joint and muscle that originate from anterior aspect of the joint (iliopsoas, sartorius, rectus femoris), create the flexion of the hip. Medially, the adductor musclulature and laterally the abductor muscles gives the ability to the femur for adduction and abduction.